The minister described it as one of the most significant changes ‘in a generation’. Social Protection Minister Regina Doherty. THE GOVERNMENT IS promising that new laws banning zero hour contracts in most circumstances will be in force in the spring. Minister for Employment Affairs and Social Protection Regina Doherty today described the bill as “one of the most significant changes to working conditions in a generation” and pledged it would be commenced in the first week of March 2019. The Employment (Miscellaneous Provisions) Bill today completed its final stage in the Seanad and has one final stage in the Dáil before it can become law. 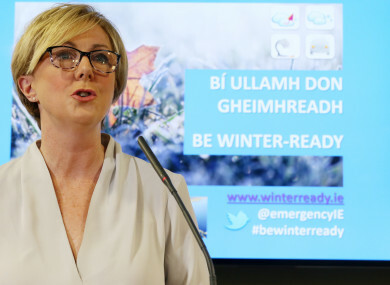 The department has said that the bill will prohibit zero hour contracts “except in situations of genuine casual employment” or when they are used to provide cover “in emergency situations or to cover short-term absence”. This amounts to “most circumstances”, according to the department. The bill also provides for new rules on banded hours, where an employee’s contract provides for fewer hours than they have been habitually required to work. Under the bill, the employee would be entitled to be placed on a weekly band of hours that better reflects the reality of the hours they work. It is argued that this would help them better demonstrate their correct employment status, improving their access to credit, including mortgages. Sinn Féin TD David Cullinane said that his party’s amendments on banded hours have been included in the final bill and he welcomed that it would be in force in March. “The current bill has two critical amendments from Sinn Féin in it. The first is the banded hours scheme, the second is the 12 month look-back period for qualification for the bands,” the Waterford TD said. The bill will also set a new minimum payment for employees called in to work but sent home again without work. Another provision means that employers must give employees five core terms of employment within five days of the commencement of employment. Employers who have not provided this statement after one month will be open to prosecution under a new offence. The minister said today that the laws will “profoundly improve the security and predictability of working hours” for those on insecure contracts. “In a changing world, this reform ensures that the legal protections for all workers will match the conditions experienced by a modern workforce and make a real difference in the lives of thousands of workers,” Doherty said. Email “New laws banning zero hour contracts 'in most circumstances' to be in place in March”. Feedback on “New laws banning zero hour contracts 'in most circumstances' to be in place in March”.